I made this for a new friend in Canada, Liz. We are both in the Mini QT swap at Flickr and were partnered up for the month of July in the beach/underwater catagory. It was a great match-up- we have a lot in common and like so many of the very same things. She received it yesterday so I can post photos of it now. And she likes it, yay, that's always nice! 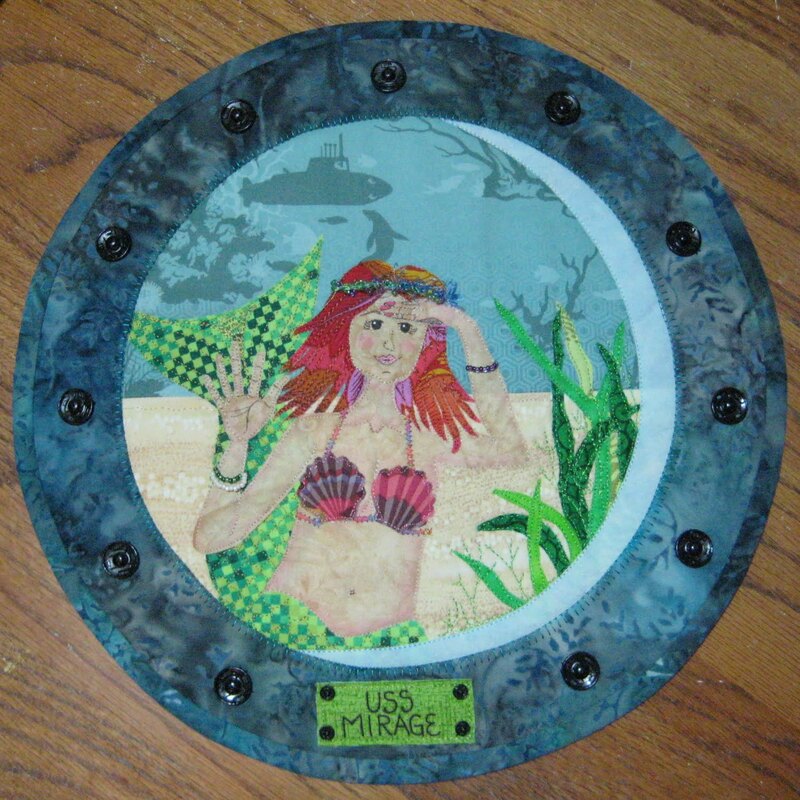 It's a mermaid looking thru the imaginary porthole on a submarine. :) Just imagine the shock the submariners would be in if they saw this for real! Hence the ship name- USS Mirage. My husband, the sailor, needed to remind me that REAL subs don't have portholes. Well, duh! (OK, I didn't really know that, but I pretended I did.) lol I sewed the bottom half of way too many snaps onto the circle to imitate hardware and then I snapped the top part onto them, so the stitching is hidden pretty much. Close up of her face. I used Kaffe Fassett fabrics for her hair and shell-top, they just seemed so perfect with the coloring and pattern in them. I used some eyelash yarn for her seaweed headband and stitched some seed beads onto it for a bit of glitz. Also, some beaded bracelets for that fun 3D effect. She's wearing a shell top because she's going to a home with a teenage boy in it. :) I didn't want her to get ogled or cause any problems. 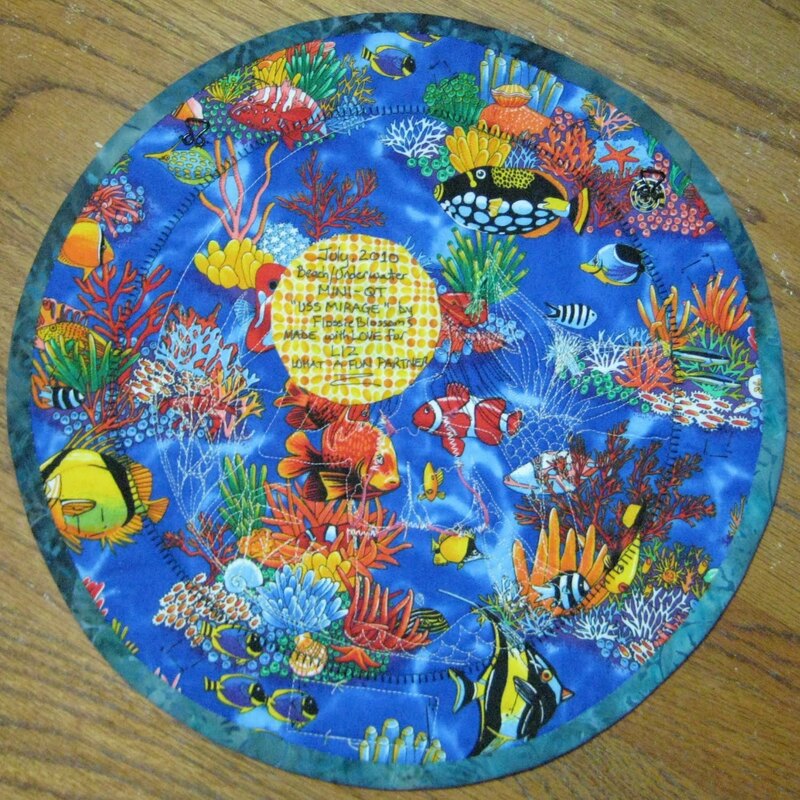 I had this fish fabric and just loved it so I used it for the back. I failed to consider how the binding would look with it, though! Ugh. Oh, well. At least the front looks good. I'm pretty sure this is the first round quiltie I've ever done.... it was fun. It's an original design and you'd believe that if you saw my trash basket full of rejected sketches! Now, I wait for what Liz has made for me, I'm so excited. This week has been so fun between receiving fabulous things and sending things out to be received. I'm loving these swaps and we are keeping the post office solvent, I'm sure of it! This is so cute! And I love the close-up of the face. 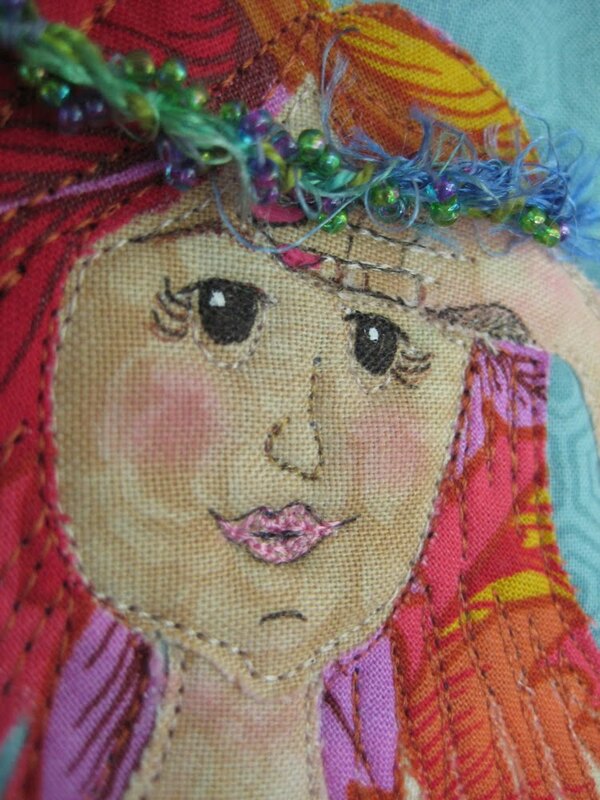 I shows all the detail and how you stitched around her face etc. to make her come alive. Having never done this kind of quilting before I am in awe of your talent! Thanks so much for sharing with all of us Susan! Susan, your creativity amazes me! This is gorgeous! You are very clever! Speechless! I mean, really. Wow. Okay, I can say that. WOW! You rock. I agree with Catherine. Your creativity is amazing. Love the details. That mermaid is too good to be true!! You are an amazing talent!! Girl. Have some talent why don't you. I just love the way your brain thinks. This is a fabulous quiltie and Liz in going to be thrilled to receive it. Without a doubt you are the most talented lady I know! What an amazing mini this is. Your partner must just be thrilled to pieces!! 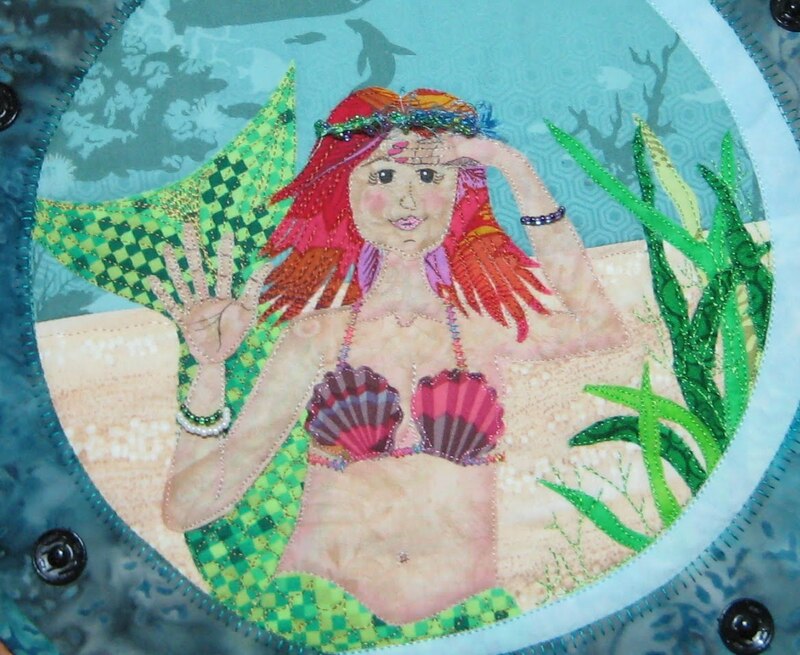 That has got to be the cutest little mermaid ever! Her face is beautiful! You have such a great talent!!!!!!!!!! Such a great job with all of the details! Love her personality! Love it! Indeed you are very talented! How fun is this! !